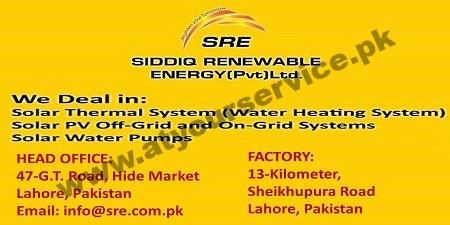 SRE is provides tailored solutions of renewable energy to Industrial and Commercial concerns in Pakistan. These solutions offer significant reduction in energy costs and at the same time are sustainable and environmental friendly. Currently, SRE is offering Industrial Solar Water Heating Systems for heating process water, in collaboration with a Sino-German Joint Venture which specializes in the area of Solar Water Heating.